All of the four balls fit nicely into the colorful duffel bag with zip closure. It is 7.5" and is surface washable. 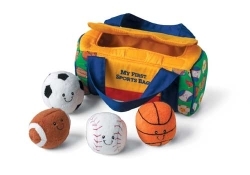 The set includes a baseball the crinkles, a basketball that rattles, a soccer ball that boings, and a football that squeaks. So much fun and perfect gift for any little fellow. For ages six to thirty-six months.